Rules of the Road: Two riders will ride a cross -country course over a series of jumps (or a prescribed route on the flat) with the object of completing the course closest to the secret optimum time. (Plus or minus). Refusals or falls don’t count, only the time. 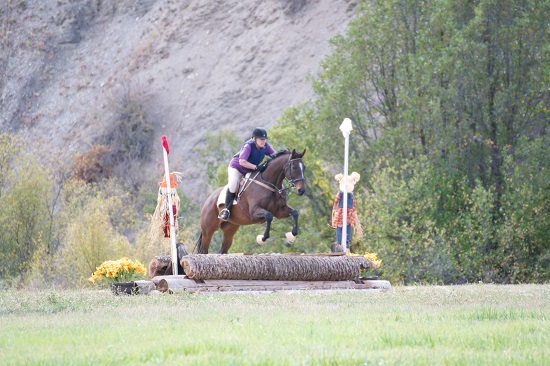 JUMPS ARE OPTIONAL BUT MUST BE FLAGGED AND JUMPED IN THE CORRECT DIRECTION AND ON YOUR PRESCRIBED COURSE! No single riders, pairs are encouraged. Teams or three are allowed but there are only two ribbons per placing. PAIRS must declare the classes in which they will compete at time of entry. A horse may compete in two jumping rounds and go again in the Hilltop (flat) with the same or a different rider. Horses may not enter more than two jumping rounds. Riders are allowed to ride more than one horse. Please consider your horse’s fitness, these courses are long and hilly! Distance measuring devices are not allowed! Informal attire: To include Boots and an approved safety helmet with the chinstrap securely fastened. Costume riders must use a saddle and a helmet! Costume Class: Will be judged before the first horse goes cross country, you need not ride in costumes and shouldn’t if they are awkward. Directions to Wonderview Farms Cross Country course: From HWY 82 Exit at Emma Rd/ Sopris Creek . (By the old white schoolhouse between El; Jebel and the main Basalt light). Turn left immediately onto Sopris Creek Rd. At the “T” by the mailboxes, turn left onto East Sopris Creek rd. Event parking is where the road turns to dirt. Park in the field on the right. GPS: 1796 E Sopris Creek Road Basalt, Co 81621 Continue past house to field on the right. PARENTS, YOUR CHILD MAY NOT PARTICIPATE IF THEY DO NOT HAVE A SIGNED RELEASE! !